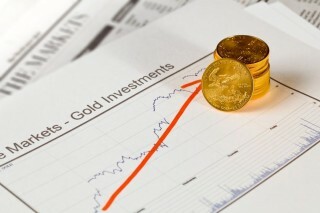 Gold bullion has long been an investment that people use to hedge against inflation. Investors pile up on the metal in the case that paper money devalues to maintain their financial position. This is a very viable and respected standpoint, but some people feel that gold can also do well in a deflationary market. BMO Capital Markets' Jessica Fung believes that the recent gold rally is owed in part to deflation of the U.S. Dollar. This seems to be contrary to most economic beliefs that gold is a hedge AGAINST inflation. On the first of the month, the core PCE index, or the core Personal Consumption Expenditure index fell 0.6% short of the predicted 2%, which should mean deflation is occurring. However, this is due largely in part to the tumbling prices of energy such as crude oil. One must consider that there is not much historic evidence to prove gold's positive performance during times like these. For the most part, it is believed that the precious metals fare better in a market with an inflated currency as investors flock to a safer investment. On the other hand, if one looks at Japan's 30+ year cycle of inflation and deflation, a noticeable uptrend has typically occurred whenever the Japanese currency strengthened. However, it is important to note that the JPY was actually losing value compared to the U.S. dollar. So the belief that deflation has a positive effect on the price of gold may be false. Gold hit a 3-month high on Tuesday. As gold prices are approaching key technical levels and the stock markets are not faring too well, investors of all sorts are on edge. Another way to look at the recent rally is completely unrelated to Fung's original prediction. Investors may be turning to the precious metals like gold as an alternative investment due to major uncertainty in the world markets. Many people believe that this "safe-haven demand" will not last, therefore serving as a poor indicator for future gold performance, but one cannot ignore the facts. Silver and gold bullion demand was at all time highs last year. This demand was most evident in the 47,000,000 Silver Eagles sold and 1,602,500 ounces of gold bullion coins sold in 2015. Along with this rise in consumer demand, came increased industrial and medical demand for silver. Ignoring these short-term increases, one must also realize precious metal demand has been on an uptrend for the past few years. It does not seem as if the demand for the metals is going to be temporary, especially with prices at these levels. If investors continue to invest in gold bullion as a safe-haven investment and the prices of gold and silver break key levels, the true potential of the metals should be realized by the masses. The moral of the story is that inflation and deflation both have their effects on the prices of gold. However, the true reason for the recent rally is most likely the weakness many economies and markets are experiencing which has been a direct cause of increased demand in gold bullion.